Christopher Hedges has been gone from the New York Times for almost ten years. He has since admitted to being a socialist, been exposed as a serial plagiarist in work he has done since leaving the Times in 2005, and authored "the first issue of the Occupied Wall Street Journal, a newspaper associated with the Occupy Wall Street protests in Zuccotti Park." Hedges is the subject of this post because, even aside from the plagiarism, he has called into permanent question the quality, accuracy and objectivity of his entire 15-year body of work as a foreign correspondent for the Times. At an obscure web site called Truthdig on December 15, Hedges called ISIS "the new Israel". 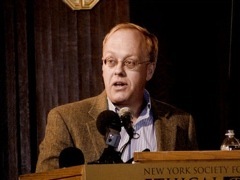 Far left writer and former reporter for the New York Times, Chris Hedges, has been exposed as a serial plagiarist. So what scurrilous "rightwing" source made these charges? None. The exposure of the socialist Chris Hedges appeared in the liberal New Republic. And it was not just a minor slip on the part of Hedges. According to the article Hedges blatantly plagiarized over and over again in great quantity over a number of years. In fact the depth of his plagiarism would make even Joe Biden blush. Here in rough chronological order are the Top Ten highlights of the New York Times' 10-year investigation into the bias of the New York Times. Come on: NYTimes Reporter Calls Tea Party 'Conservative,' But Noam Chomsky Merely a 'Dissident Thinker'? New York Times legal reporter Charlie Savage showed his usual labeling blindness in Friday's piece on strange political bedfellows that oppose indefinite detention: "House to Consider Proposal to Bar Indefinite Detention After Arrests on U.S. Soil." The late left-wing historian Howard Zinn was one of America's best-known public intellectuals. His 1980 opus A People's History of the United States is widely used as a high-school and college textbook, and he had plenty of fans in the entertainment world, among them Matt Damon and Ben Affleck (A People's History got a shout-out in Good Will Hunting) as well as Bruce Springsteen and Pearl Jam lead singer Eddie Vedder. Not long before Zinn died in January 2010, he told The Nation, regarding President Obama's first year in office, "I've been searching hard for a highlight. The only thing that comes close is some of Obama's rhetoric; I don't see any kind of a highlight in his actions and policies." The New York Times's former Middle East Bureau Chief thinks violent revolt is a laudable response to economic woes, and that murder is at least acceptable in pursuit of a far-left agenda. The media so concerned with the potential for violence from conservative groups are completely silent. "Here’s to the Greeks," wrote Chris Hedges at Truthdig.com. "They know what to do when corporations pillage and loot their country." Riot, by Hedges's account, is the correct response. That the riots in Greece have so far killed three innocent people doesn't seem to bother him. Oh but it's not violence borne of a frustration with an unsustainable welfare state that finally reached the inevitable conclusion of skyrocketing public benefits coupled with a fast-shrinking population. No, the riots are "a struggle for liberation" against the oppressive bourgeoisie (capitalists). Hedges is advocating in no vague terms mass political violence. The response from the media: crickets. The leftist blog The Raw Story is hyping an exclusive: "Famed NYT reporter tells Michael Moore capitalism driving humanity’s downfall." It’s merely an outtake from Moore’s hostile movie Capitalism: A Love Story. Former New York Times reporter Chris Hedges, the radical author of books like "American Fascists: The Christian Right and the War on America," warns of the coming eco-catastrophe. But in one clip cut from the documentary -- which Moore provided exclusively to Raw Story -- he interviews Pulitzer Prize-winning New York Times reporter Chris Hedges, who explains how capitalism is actually contributing to the very downfall of the human race and the "degradation of the planet." The corporate forces that are looting the Treasury and have plunged us into a depression will not be contained by the two main political parties. The Democratic and Republican parties have become little more than squalid clubs of privilege and wealth, whores to money and corporate interests, hostage to a massive arms industry, and so adept at deception and self-delusion they no longer know truth from lies. We will either find our way out of this mess by embracing an uncompromising democratic socialism—one that will insist on massive government relief and work programs, the nationalization of electricity and gas companies, a universal, not-for-profit government health care program, the outlawing of hedge funds, a radical reduction of our bloated military budget and an end to imperial wars—or we will continue to be fleeced and impoverished by our bankrupt elite and shackled and chained by our surveillance state. Considering how many hyperventilating media leftists broke their promises to leave the country if George W. Bush won reelection in 2004, I'm not exactly holding out hope we'll see the IRS arrest former New York Times bigwig Chris Hedges (file photo at right) anytime soon. Hedges, if you recall, was the paper's former Middle Eastern bureau chief who became more famous (infamous rather) for his lengthy anti-war diatribe during a 2003 speech to graduates of Rockford College. A battle of wits between two men named Christopher took place in Berkeley, California, on May 24. Unfortunately, one contestant came embarrassingly unequipped, so much so that by the end, he chose to not even respond. Break out the cashews and your favorite libation, sports fans, because this debate between former New York Times Pulitzer Prize winner Chris Hedges, and the never at a loss for words Christopher Hitchens was one for the ages. Chris Hedges, who served at the Times as a reporter and Middle East bureau chief for a total of 15 years, appeared last Thursday on Comedy Central's "The Colbert Report," hosted by Stephen Colbert, to discuss his new book, "American Fascists: The Christian Right and the War on America." You may remember Hedges for being booed off a college commencement stage in the middle of an anti-war rant in May 2003.